"Amman Airport" redirects here. For Amman's other airport, see Amman Civil Airport. Queen Alia International Airport (QAIA) was built in 1983 in response to the growing airport traffic needs that Amman Civil Airport could not accommodate. At the time, passenger traffic was increasing above the international average, recording 25–30% growth per annum and placing considerable pressure on airport facilities despite continuous expansion and development. In 1981, the number of arriving, departing and transit passengers exceeded 2.3 million, while cargo traffic reached 62,000 tons and aircraft traffic topped 27,000 movements. The Jordanian Ministry of Transport undertook to build a new international airport with sufficient capacity to cope with demand in the foreseeable future. QAIA was built at an estimated total cost of JOD 84 million. Passenger facilities were designed to serve 3.5 million passengers per annum. QAIA has since grown to become the kingdom's primary international gateway and a stop-over for international airlines in the Middle East. By 2012, QAIA was serving on average more than 6 million passengers and 40 airlines from around the world. In 2007 the Government of Jordan selected Airport International Group (AIG) through an open tender to operate, rehabilitate and manage QAIA under a 25-year concession agreement. In response to the continual surge in passenger traffic at the time, AIG was also placed in charge of constructing a new terminal, one which not only would expand the airport's then insufficient annual capacity of 3.5 million passengers, but that would also introduce a "unique travel experience" to help advance QAIA's position as a niche transit hub in the region. Accordingly, AIG invested an estimated US$750 million in the construction of the new terminal. The new terminal is also equipped to accommodate rising annual passenger traffic, taking the original airport capacity from 3.5 million passengers per year to 7 million. 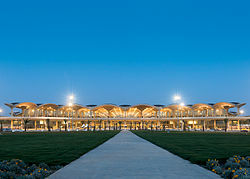 Inaugurated on 14 March 2013, by King Abdullah II, the new airport was officially launched following an overnight operational transfer. The last flight departed from the old terminal at 10:05 pm on 20 March 2013, upon which all operations were shifted to the new terminal, where its first flight departed at 2:30 am on 21 March 2013. On 20 January 2014, AIG launched the second phase of QAIA's expansion, valued at a total cost of over US$100 million. Completed in 2016, the second expansion phase raised QAIA's annual passenger traffic capacity to up to 12 million and was priced at $1 billion, subsequently supporting Jordan's national tourism strategy goals to serve as a regional transit hub for leisure and business travel. The aims to boost its capacity to 16 million passengers annually by the end of the concession time frame in 2032. Following the airport expansion, Emirates operated a one-off Airbus A380 service to Amman, celebrating 30 years of Emirates' operation to Jordan. The super jumbo (registration A6-EUC) operated EK901/EK902 on September 25, 2016, and it was the first ever A380 service to the Levant. QAIA's new design was created by architects Foster + Partners. Its main characteristic is the roof that was inspired by Bedouin tents and is composed of 127 concrete domes, each weighing up to 600 metric tonnes. The airport has three lounges, one operated by Royal Jordanian for business and first class passengers, and one operated by Airport Hotel next to the North Concourse, and the last exclusively run by telecom operator Zain Jordan for its VIP customers. Retail space was expanded by 25% at the new terminal, covering more than 6,000 square metres (65,000 sq ft). The terminal houses several international food and beverage venues that include restaurants, supermarkets and a nuts roastery; a larger Duty Free area; a children's play area; additional shopping outlets; and internet connectivity. Airport International Group (AIG) is a Jordanian company formed to rehabilitate, expand and operate Queen Alia International Airport under a 25-year Build-Operate-Transfer (BOT) concession agreement. The concession was awarded to AIG in 2007 by the Government of Jordan after an open international tender that was overseen by the International Finance Corporation of the World Bank acting as an advisor to the Government. AIG's shareholders are French, Persian Gulf, and Palestinian partners. As of 2018, 51% of the shares are owned by Aéroports de Paris (ADP). The other shareholders are Meridiam Eastern Europe Investments (32%), Mena Airport Holding Ltd. (funded by the IDB; 12.75%) and the EDGO Group (owned by the al-Masri family; 4.75%). Through the BOT public-private partnership framework, the Government retains ownership of the airport and receives 54.47% of the airport's gross revenues for the first six years, and 54.64% of the gross revenues for the remaining 19 years of the agreement's 25-year term. As part of its public-private partnership with the Government of Jordan, AIG closely collaborates with the Government on a day-to-day basis on all issues related to the airport. A dedicated project management unit within the Jordanian Ministry of Transport oversees the project for the Government. The Ministry of Transport receives full annual financial statements as well as quarterly financial and operational reports. Queen Alia Airport has various amounts of cargo traffic, both unscheduled and scheduled. Various airlines including Royal Jordanian Cargo, operate unscheduled freighter flights in and out of Queen Alia Airport to various parts of the world. As of 2015, Queen Alia became the hub for some of the US military contract flights supplying machinery and equipment to the region. The global Airport Service Quality (ASQ) Survey for Q1 2014 ranked QAIA at first place in 18 different service and facility categories from among 10 airports across the Middle East. QAIA also came in at 13th place from amongst 81 airports worldwide within the group of airports serving 5-15 million passengers and recorded an Overall Satisfaction Score of 4.42 out of a possible 5.0, an improvement compared to its 4.23 score in Q4 2013. With regards to luggage delivery speed, QAIA earned a 4.13 score, up from 3.99 during the previous quarter. QAIA also received two 2013 Airport Service Quality (ASQ) Awards in February 2014, ranking at 1st place in the category of "Best Improvement by Region: Middle East" and 5th in the category of "Best Airport by Region: Middle East". The ASQ Awards results are based on the ASQ Survey, an international airport passenger satisfaction benchmark program. In the 2014 version of the wards, QAIA again received the "Best Improvement In the Middle east region" award and leaped forward to become the best airport in the middle east, ahead of Abu Dhabi International Airport, Ben Gurion International Airport, Hamad International Airport and Dubai International Airport. In March 2013, QAIA was named one of the world's top 40 Public–private partnership PPP projects, receiving Gold recognition as "Best Emerging Market Infrastructure Project for Europe, Central Asia, the Middle East and North Africa" in Emerging Partnerships. The winning PPPs, selected from among projects nominated by governments, industry, NGOs, academia and other organizations following a global call for submissions, demonstrated best practices for governments working with the private sector to provide a wide range of public services and to spur economic development in their countries. In June 2013, QAIA became the second airport in the Middle East to achieve the "Mapping" level of the Airport Carbon Accreditation program run by Airports Council International Europe. The 'Mapping' level recognizes the airport's commitment to determining its carbon dioxide and other greenhouse gas emission sources at its operational boundary, as well as to engaging a third party to verify the airport's annual carbon footprint. The airport is connected to Amman by Sariyah shuttle buses that ply back and forth around the clock between Amman and the airport every 30 minutes. An airport taxi service is also available around the clock. A Rent-a-Car service is also available at the airport. Departure curbside area: Reserved for passenger drop-offs and pick-ups, drivers entering the departure curbside must purchase a ticket to enter. Drivers receive a 10-minute free-of-charge grace period. Short-term parking lot: Cars parked in this area are subject to an hourly parking fee. Long-term parking lot: Designed for passengers who wish to leave their vehicles at the airport while travelling, the long-term lot charges drivers daily parking fees. A shuttle bus is available to transport passengers between the terminal and car park. ^ Ghazal, Mohammad (14 March 2013). "King Abdullah Opens New Queen Alia Airport Terminal". The Jordan Times. Amman, Jordan: Jordan Press Foundation. Archived from the original on 11 May 2014. Retrieved 4 February 2014. ^ "Middle East". Retrieved 4 June 2015. ^ "Arab Passengers' Airlines Framework and Performance" (PDF). Economic Research Forum. Archived from the original (PDF) on 23 April 2014. Retrieved 4 February 2014. ^ a b c Tribute to King Abdullah II of Jordan – Celebrating 15 Years of Leadership, "Celebrating 30 Years of Queen Alia International Airport". ^ a b "QAIA Project". Airport International Group. Retrieved 4 February 2014. ^ "Queen Alia International Airport Takes Jordan's Aviation Industry to New Horizons" (Press release). Amman, Jordan: Airport International Group. 14 November 2011. Retrieved 4 February 2014. ^ a b Maslen, Richard (27 March 2013). "New Terminal Opening Boosts Queen Alia Airport's Capacity". Routesonline. Manchester, United Kingdom: UBM Information Ltd. Retrieved 4 February 2014. ^ "AIG Makes Substantial Headway in the Renovations of QAIA's Warehouses" (Press release). Amman, Jordan: Airport International Group. 28 August 2012. Retrieved 4 February 2014. ^ "New QAIA Terminal Officially Launches Full Operations" (Press release). Amman, Jordan: Airport International Group. 21 March 2013. Retrieved 4 February 2014. ^ "Upgraded airport greets 8m passengers". The Business Report. Retrieved 14 November 2018. ^ "New phase of airport expansion completed, inaugurated". 6 September 2016. Retrieved 20 May 2018. ^ "Queen Alia International Commences Second Phase of US$100m Expansion Project". Passenger Terminal Today.Com. Retrieved 20 May 2014. ^ "Official Opening of Queen Alia International Airport in Amman, Jordan" (Press release). Amman, Jordan: Foster + Partners. 21 March 2013. Retrieved 4 February 2014. ^ Dalgamouni, Rand (9 March 2013). "New QAIA Terminal Gears Up for Opening Day". The Jordan Times. Amman, Jordan: Jordan Press Foundation. Archived from the original on 11 March 2014. Retrieved 4 February 2014. ^ "Queen Alia International Airport Project, Jordan" (PDF). Norton Rose Fulbright. Archived from the original (PDF) on 22 April 2014. Retrieved 4 February 2014. ^ "Timetables". Retrieved 21 April 2014. ^ "Air Arabia Egypt Launches New Flights Connecting Sharm El Sheikh and Amman". albawaba.com. ^ "Air Cairo adds Sharm el Sheikh – Amman route from April 2019". routesonline.com. ^ "flydubai to add new operations from DWC". flydubai. 4 August 2015. Retrieved 4 August 2015. ^ "Laudamotion adds Vienna base in W18". Routesonline. Retrieved 2 September 2018. ^ "Georgia's Myway Airlines launches scheduled services - Russian aviation news". 19 June 2018. ^ Liu, Jim (14 March 2018). "Norwegian adds Copenhagen – Amman service from May 2018". Routesonline. UBM (UK) Ltd. Retrieved 14 March 2018. ^ "Pegasus Adds Ankara – Amman Service from late-March 2016". airlineroute. Retrieved 23 February 2016. ^ "Pegasus expands Middle East network in S18". Routesonline. Retrieved 20 May 2018. ^ "Royal Jordan Adds Najaf Service from mid-June 2015". Airlineroute.net. 8 June 2015. Retrieved 8 June 2015. ^ 2018, UBM (UK) Ltd. "Royal Jordanian Adds Tabuk Flight from mid-July 2015". Retrieved 20 May 2018. ^ "Turkish Airlines adds seasonal Antalya – Amman route in S17". routesonline. Retrieved 23 March 2017. ^ "Jordan Times". www.jordantimes.com. Retrieved 20 May 2018. ^ "Queen Alia International Airport (QAIA)". Retrieved 4 June 2015. ^ a b "خبرني : أسواق : مطار الملكة علياء يستقبل 7 ملايين مسافر بـ 2014". Retrieved 4 June 2015. ^ "خبرني : أسواق : مطار الملكة علياء يستقبل 7 ملايين مسافر بـ 2014". ^ "مطار الملكة علياء الدولي يسجل أعلى حركة مسافرين في تاريخه". Retrieved 20 May 2018. ^ a b "Queen Alia International Airport Welcomes Over 7.9 Million Passengers in 2017". Airline International Group. Retrieved 20 May 2018. ^ "About the ASQ Awards". Airports Council International. Retrieved 8 April 2014. ^ "1st place for QAIA: Jordan Secures Service Quality Awards for Excellence in Customer Service" (Press release). Amman, Jordan: Airport International Group. 26 February 2014. Retrieved 4 February 2014. ^ "Current Winners". Retrieved 4 June 2015. ^ a b "QAIA Receives 'Gold' Recognition as Best Emerging Market Infrastructure Project" (Press release). Amman, Jordan: Airport International Group. 1 April 2013. Retrieved 4 February 2014. ^ "QAIA Receives Airport Carbon Accreditation" (Press release). Amman, Jordan: Zawya. 27 June 2013. Retrieved 4 February 2014. Airport information for OJAI at World Aero Data. Data current as of October 2006.Source: DAFIF. Airport information for OJAI at Great Circle Mapper. Source: DAFIF (effective October 2006).